Visit a world where you can fly dragons! Imagine a stable full of dragons to groom, train and ride! That’s Dragonsdale, a riding school run by Cara’s father. 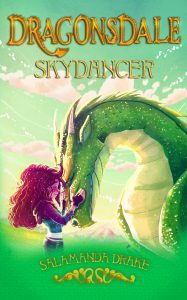 So, we have finally decided that the time is right to bring out all 4 Dragonsdale books to complete the story of Cara and her dragon, Skydancer! We are self-publishing these books, initially through Amazon’s Create Space Programme, which gives us control of the series! Visit www.dragonsdale.net for more information about the wonderful world of Dragonsdale. All Cara’s friends are busy preparing their dragons for the Island Championships. But ever since her mother’s terrible riding accident, Cara is forbidden to ride. 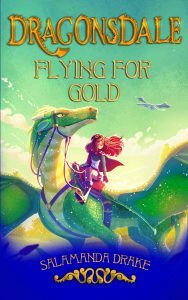 Against her father’s wishes, she trains the wild dragon, Skydancer, in secret, and dreams of a day when she, too, can take flight! 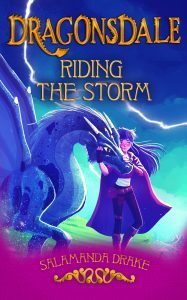 There’s trouble ahead for best friends, Cara and Breena and their dragons. When Moonflight is injured, Breena can’t qualify for the Island Chmpionships. Worse, she falls out with Cara who is flying superbly on Skydancer. Soon their friendship is put to the ultimate test – but can it survive? The midwinter festivities are in full swing at Dragonsdale, and the riders and their dragons are looking forward to Yuletide. But trouble is brewing! 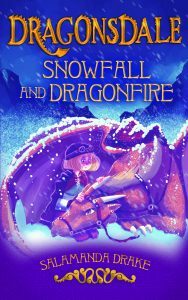 A newcomer arrives at the stables, asnowstorm brings peril to the Dragonsdale riders and Hortense is determined to ruin the holidays for Cara and her friends. It looks like being a Yuletide to remember! Cara wants to equal her mother’s feat of winning every Clear Flight event and the Junior Island Championship in the new showing season. But from out of the blue, Hortense acquires a new dragon and becomes a serious rival. Cara needs every minute of practice, but after Mistress Hildebrand suffers a serious accident, she is forced to instruct the younger riders instead. And when things can’t seem to get any worse, Cara is caught up in events that could change her life forever. Will Cara become Junior Riding Champion and fulfil her dreams?